FORT MYERS, FL (April 16, 2001) – Rosemont, the second residential building to be completed in The Woodlands at Shell Point, began welcoming its residents to move in this April and May. (photo at right) New Rosemont residents George and Renee Fitzgerald (center) are the first to move in. Helping them with the move are their daughter Kathy Rich (left, with husband Larry) and their son Pat Fitzgerald (right). This marked yet another milestone in the 10-year expansion plan of Shell Point Retirement Community. Founded in 1968 by the Christian and Missionary Alliance, The Island at Shell Point now has over 1,400 residents. Seeing the need for more top-quality programs and services, Shell Point purchased 700 adjacent acres in 1998, with an ambitious 10-year plan to expand and build more communities. FORT MYERS, FL (April 1, 2001) – We’re blessed to share our small part of the planet with an abundance of wildlife, many of which find Shell Point a safe haven. Many residents enjoy watching manatees as they frolic in the security of the lagoon on The Island. Dolphins often patrol our waterfront on the Caloosahatchee River. The local waterways are also popular places for visits by egrets and ibis, along with ducks, turtles, and fish. Nesting platforms have been placed around The Island for the ospreys that return every year to nest and raise their young. In the past couple of years we have enjoyed visits from a pair of American oystercatchers who have been nesting on our Island beach, where Shell Point personnel carefully rope off the nesting area to protect these unique birds and their offspring. Considering the sanctity all this wildlife that surrounds Shell Point, we must be careful how the lives of the 1,500 residents and 600 employees impact the habitats of the wildlife. So when Shell Point decided to purchase 780 acres of property to expand its programs and services for Shell Point residents, we took the initiative in assuring that the environment would continue to allow native plants and animals to thrive. Most importantly, a large portion of the new land will be eternally preserved for wildlife and the ecosystem that serves it. The property on the west side of Shell Point Boulevard has been deeded back to the state of Florida to be maintained forever as part of the Estero Bay State Buffer Preserve. This land (approximately 500 acres) is made up mostly of submerged wetlands, which are important to preserve not only for the wildlife that inhabits the area but also for the benefits that the wetlands provide to surrounding water bodies. Before turning this land over to the state, Shell Point eradicated all the exotic plants (plants not native to this area). Exotic plants such as the melaleuca and Brazilian pepper trees, need to be eradicated because they crowd out native species of plants which are beneficial to wildlife. A large mosquito ditch running parallel to Shell Point Boulevard, which interrupted the natural flow of water, was filled and leveled to a height to recreate historical water flow and increase the likelihood of regrowth of native plant species. There are three separate preserves within the actual boundaries of the expansion property, including a 27-acre wetland area called a slough. In another preserve area, a borrow pit (a large manmade lake) exists. It was dug long ago to get fill dirt to form Shell Point and McGregor Boulevards. This is a popular spot for wading birds and for different species of fish. We’ve gone to great lengths to protect one species of bird in particular: a pair of nesting bald eagles. Currently there is a 1500-foot radius around its nest, located near the 8th hole of the Shell Point Golf Club. No construction will occur during its nesting season (October 1 – May 15). In 1967, the bald eagle was officially declared an endangered species under a law that preceded the Endangered Species Act of 1973; it is also protected as a national symbol under the Migratory Bird Treaty Act and the Bald and Golden Eagle Protection Act. Another wildlife neighbor that lives on Shell Point’s new property is the gopher tortoise. These slow-moving reptiles are so named because they dig burrows in the ground to call home. Shell Point has spent approximately $25,000 so far to relocate the gopher tortoises to a fenced-in preserve area consisting of almost four acres, where they will be protected from danger and out of the way of future construction. Shell Point has also taken care to preserve land inhabited by those who came before us. Through an archeological survey of the property, a mound was found, approximately one acre in size, that is believed to have been used for burial purposes by a Native American civilization between 650 and 1200 A.D. This burial mound will be preserved in perpetuity. 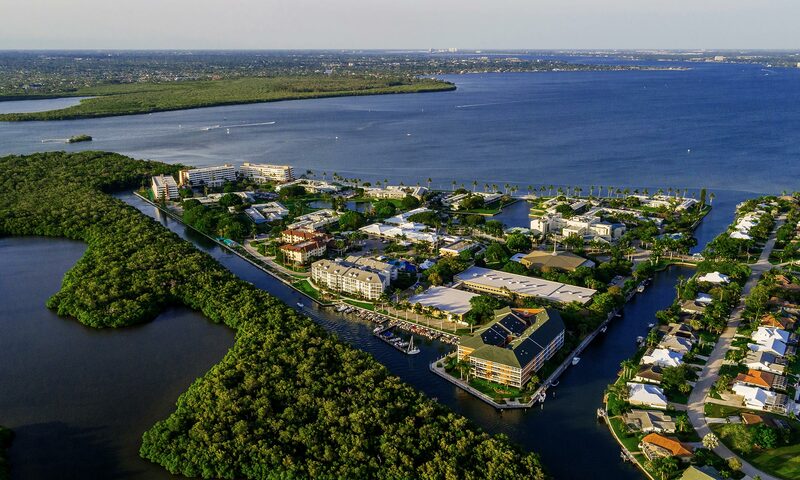 It’s no easy matter to buy and build on land in southwest Florida. Shell Point has undergone intense scrutiny from many environmental agencies, including the South Florida Water Management District, Corps of Engineers, Regional Planning Council, Fish and Wildlife Service, and Lee County; that’s a lot of people to satisfy. But Shell Point is committed to partnering with these agencies to maintain an ecological balance for these plants and animals. We welcome these “wildlife neighbors,” some old and some new, into the Shell Point family.